Lead Runner it's a small but essential sound tool for every serious electronic musician. As the name suggests it is inspired by one of the iconic sounds in the history of synthesizers: the Blade Runner lead sound originally created on the almighty Yamaha CS-80 by Vangelis. Lead Runner captures the essence and feeling of the original Blade Runner lead sound like never before. Lead Runner 1: This patch is a little gem on its own. The modulation wheel controls the filter transforming the the tone from a gentle and subtle "flutish" sound to the mighty brassy sound we all know. 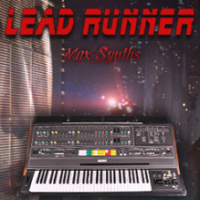 Lead Runner 2: This patch captures the feeling of the Vangelis lead sound and is characterized by a warm feeling. It is ideal for slow and quiet passages/songs. The modulation wheel is programmed to slowly detune the sound when needed. Rumble Sound: This is an emulation of the classic "rumble sound" that can be heard in many passages of the Blade Runner soundtrack. In many situations it helps to give the impression to travel into space and it's a very inspiring accompainment while improvising with the main lead(s) sounds. GENRES: Electronic, Film Music, New Age, etc. REQUIREMENTS: a full version of Native Instruments Kontakt (v.4.2.4 or above) is required. The library will work in DEMO mode with the free Kontakt Player.